Noonan syndrome is a disease that can be passed down through families (inherited). It causes many parts of the body to develop abnormally. Noonan syndrome is linked to defects in several genes. In general, certain proteins involved in growth and development become overactive as a result of these gene changes. Noonan syndrome is an autosomal dominant condition. This means only one parent has to pass down the nonworking gene for the child to have the syndrome. However, some cases may not be inherited. The health care provider will perform a physical exam. This may show signs of heart problems the infant had from birth. 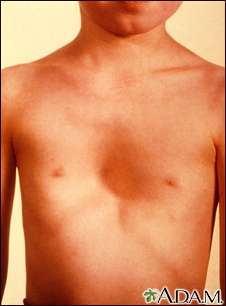 These may include pulmonary stenosis and atrial septal defect. Genetic testing can help diagnose this syndrome. There is no specific treatment. Your provider will suggest treatment to relieve or manage symptoms. Growth hormone has been used successfully to treat short height in some people with Noonan syndrome. The Noonan Syndrome Foundation is a place where people dealing with this condition can find information and resources. This condition may be found during early infant exams. A geneticist is often needed to diagnose Noonan syndrome. Couples with a family history of Noonan syndrome may want to consider genetic counseling before having children. Ali O, Donohoue PA. Hypofunction of the testes. In: Kliegman RM, Stanton BF, St. Geme JW, Schor NF, eds. Nelson Textbook of Pediatrics. 20th ed. Philadelphia, PA: Elsevier; 2016:chap 583. Cooke DW, Divall SA, Radovick S. Normal and aberrant growth in children. In: Melmed S, Polonsky KS, Larsen PR, Kronenberg HM, eds. Williams Textbook of Endocrinology. 13th ed. Philadelphia, PA: Elsevier; 2016:chap 24. Madan-Khetarpal S, Arnold G. Genetic disorders and dysmorphic conditions. In: Zitelli BJ, McIntire SC, Nowalk AJ, eds. Zitelli and Davis' Atlas of Pediatric Physical Diagnosis. 7th ed. Philadelphia, PA: Elsevier; 2018:chap 1.